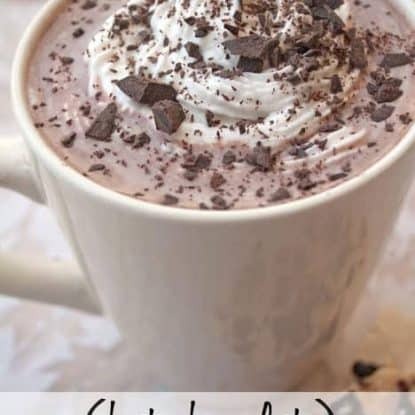 This simple vegan hot chocolate recipe uses only 4 ingredients and is perfect for those with food allergies. It tastes great too and is the perfect thing to warm you up on chilly fall and winter days. But this dairy-free hot chocolate is so good–who says you can't drink it all year long? I love making my own healthy versions of processed foods like homemade chocolate chips, homemade white chocolate chips, taco seasoning, easy homemade ketchup, balsamic salad dressing, and even paleo taco shells. Today I'm sharing with you another healthier version of a typically processed food–hot chocolate. 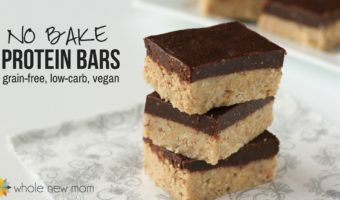 This recipe is perfect for those who are avoiding dairy and sugar and it's so much better for you than the packaged brands. I am blessed, there are no two ways about it. I have a great family, a wonderful hubby, and I couldn't be more proud of my little girls. I know – every mom says that, but I really, truly am. I had moment of heart-bursting love and awe with my two and a half year old last weekend that made me feel beyond blessed. We were visiting Grandma and Grandpa in the country and it was finally warm enough to go outside and play in the snow. And was there ever snow. The massive yard was waist high with white stuff. It had been a very rough few weeks for me and I was ecstatic to get out in the sun and enjoy the fresh air. So out we went. My little peanut and I bundled up. The wind was colder than we had expected, but we weren’t about to let that ruin our fun. My little one had never played in these conditions. We'd gone for some toboggan rides (pulled by mommy), shoveled a bit, and thrown some snow up in the air, but she had never trudged. So what was my duty? To help her out, blaze a trail, have her walk in my footsteps, to make the trek easier for her, of course! So there I was, trudging away in thigh-high snow, trying to stay on top of the harder, packed parts for the most part, musing dramatically about how I was blazing a trail literally and perhaps figuratively, for my girl. As I did this, heading for the gazebo that was boarded up for the winter, I saw my little girl out of the corner of my eye. Wait…what? The corner of my eye? I thought she was behind me–in my footprints, taking the path I had made for her, blazed for her, to help her out, to make it easy for her! No, there she was, walking beside me, finding her own way, blazing her own trail through the deep heavy snow and I mean deep, heavy snow. I was taken aback. I had underestimated my little girl. She was stronger than I'd given her credit for. I beamed with pride while wanting to burst into tears at how grown up she was. “we gotta go find more bunny poop” (the resident bunnies had left piles all over the yard). I was so proud of my confident, adventurous, imaginative and self-assured little girl. She was blazing trails and making tracks where there were none. We went to each and every cold corner, up the hill, down the hill, and through the trees–to places that no one had walked all winter. The wind started to pick up, so I began planting the idea of hot chocolate in her head. Well, after my suggestion and one more trek up the hill to look for bunny poop she said, “it’s getting chilly, better go in for hot cocoa”. So in we went, and to add to her independent day, she scooped her own cocoa powder, dropped in her own stevia and stirred it all up in the milk. I’m surprised she didn’t heat it up on her own out of pure will :). We usually try to give her carob when it is later in the afternoon (to avoid caffeine) but I wasn’t about to split hairs after the moment we’d had. And Grandma had cocoa, so cocoa it was! She loved it, and savoured every last drop. This drink is so satisfying and will warm you from the inside out. It's perfect on a cold winter day or any day at all. In fact, I imagine myself (when I have time to read again) curling up with a good book and a giant mug of this on a crisp autumn day or during a spring thunderstorm–cozy. Pair this hot chocolate with a grain-free Carob Cardamom Cupcake, a delicious Soft Pumpkin Cookie, or a slice of pumpkin pie using Easiest Pie Crust. 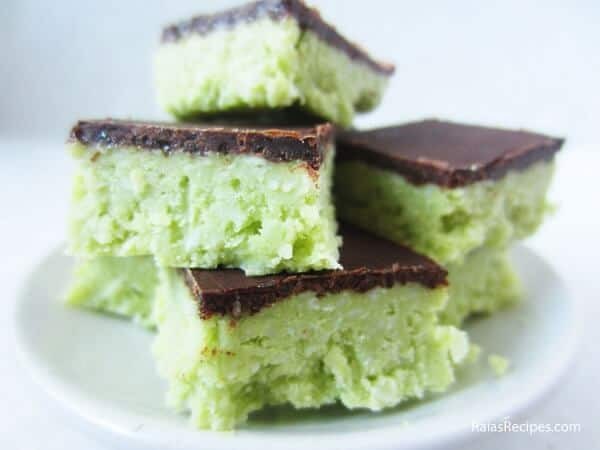 There are many variations to this recipe and you really can’t go wrong. We've used a variety of non-dairy milks from almond (my favourite being vanilla almond), hemp, rice, coconut and even water and they all have turned out just fine. 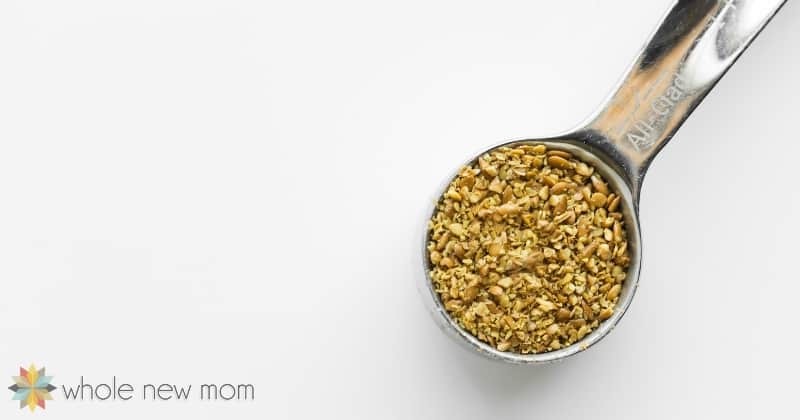 The carob powder is quite sweet on its own so you don’t need much stevia or sweetener, which is always a plus. I also discovered last time I made this that a combination of about 1 tbsp carob and 1 tsp cocoa made a lovely mixture but start with small amounts and adjust to your tastes! You could use stevia, as I did, or honey or maple syrup (this would make for an interesting flavour variation) or if you find the carob version sweet enough you may not need sweetener at all. Top this with coconut whipped cream (or this “faux coconut whipped cream“), real whipped cream (if you are able to eat it), cashew cream or sans cream (which is how I usually enjoy it). The possibilities are endless. But please, whatever you do enjoy it. Homemade Dairy-Free Milk: If you would like to make your own non-dairy milk, here is Easiest Coconut Milk, Easiest Almond Milk, and Homemade Rice Milk. Carob: Here is a great option for organic carob powder. Homemade Liquid Stevia: If you would like to make your own liquid stevia, see Homemade Liquid Stevia. AIP: Use carob instead of cocoa and use approx. 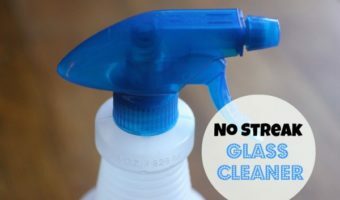 2 tsp maple syrup (read this post for help choosing maple syrup) or honey instead of stevia. Easy Homemade Vegan Hot Chocolate - Dairy Free and Sugar Free. 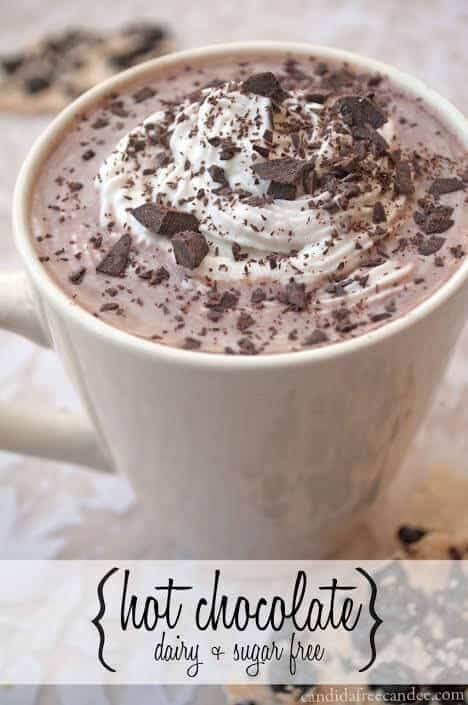 This dairy-free hot chocolate recipe will warm you and is perfect for those with food allergies. Place all ingredients in a small saucepan and whisk over low heat until combined and desired temperature has been reached. Life is so short, and I want to savor each and every moment with my family, because it’s true what they say–it goes by too fast. So if you will pardon me, I'm off to the kitchen. I think my snow-trekking little girl and I deserve another cup of hot cocoa. Have you made Homemade Hot Chocolate before? Candace is a stay-at-home-mom, wife, graphic designer and food lover. 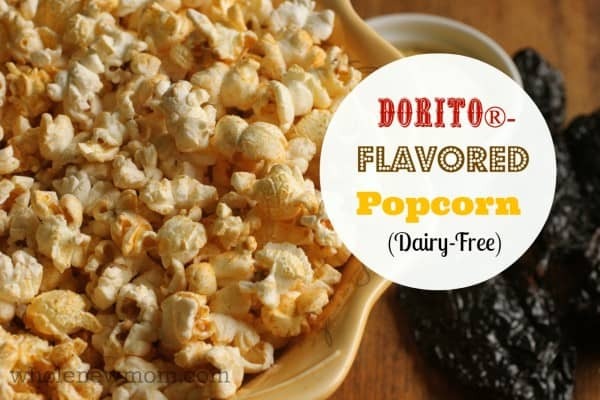 She loves to make healthy, whole foods that are dairy free and candida friendly. She loves being a mom and is passionate about parenting, living healthy and helping others do the same. Can I use splenda or stevia sugar pellets because I do not have liquid stevia. How many should i use? You could do that of course. I don’t know those products well but if you look at a liquid stevia conversion chart that should give you an idea of how to figure it out. Let me know if that doesn’t make sense.